Hi all! Welcome to Day 1 of Introductions! 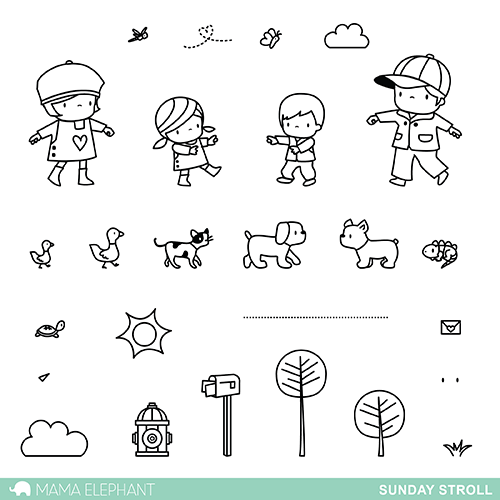 Today we are taking a look at Sunday Stroll. We previously gave you some sneak peeks over at Instagram and Facebook and it looks like many of you are as excited about it as we are! Sunday Stroll is such a delightful, every day kind of set. We love it for its charm and many, many possibilities. Just take a look at the images carefully and you will see that you can tell a very unique story just by picking and choosing which images you pair them with. For pet lovers, you can have a number of combinations of your little boy or girl walking their pet. The dotted line is an optional leash. I chose to draw mine in, it's just easier for me. This can be a great sibling set, with the older kids holding onto the younger. This can be also be a cute love card with the little people or the animals meeting up! For my card, I've got the bigger girl holding onto her little sister and walking two cuties. So much fun, you really can't go wrong! Angela literally made a story with these stamps! Enjoy! We'll be looking at this set again tomorrow along with the companion sentiment set Sunday Sentiments. Wow!!!!! So cute! And what a nice video!! :) I love them! Oh my gosh, this stamp set is just too darling. What an adorable stamp, super cute and I can't wait to see the rest of the release too! this is darling. You can make so many combinations. This is just absolutely adorable! Can't wait to get this! Ahhh ....cuteness-overload... I love it ! OMG, I can't wait!!! Another "to die for" set!!! This set is so stinking sweet! In love with this stamp set! Wow! The stamp story...awesome, just awesome! OH MY gosh, I said when I saw the sneak that it looked like this set had it all and it totally doens't disappoint, it's adorable! Oh my goodness, the video!!!! Love, love, love! So cute! I love this stamp story! Oh my word! How CUTE!!! I can’t wait, all too stinking cute! This stamp set is just the cutest! So sooo many possibilities!! Oh such a sweet love story! SO SO SO SO CUTE!!! And that little video was ADORABLE!!! Love it!! Wow, that must have taken so much time!! AMAZING!!! You have just stolen my heart, or at least this stamp set has. How adorable!!! Oh my goodness...Too CUTE for words! Sooooo cute!!!! Lots of possibilities. just one question...what are the two dots for? I am in love with this stam set. It is so versa lie and cute. Way to cute, into my wish list it goes!!! Cute story... Beautiful stamp set. Angela your video story is precious!!!! What a fun set! Love!!!! !